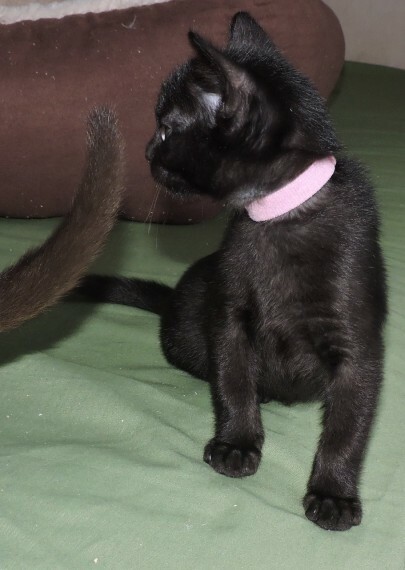 Pedigree female Bombay kitten .pink collar.. Jax Midnight . Girl will be registered with the GCCF .Governing Council of the Cat Fancy. on the inactive register. Or on the active register to the right person. Mum. Dad and Grandma can be seen and they are all Champions. All of my kittens are free from hypokalaemia. They are reared in our home and when they leave here at 13 weeks old .mid December. they will be used to household noises including our dog. The kittens will be weaned. wormed. litter trained and vaccinated including leukaemia. They will have had two vet checks. She has had her first health check and vaccination and all is good. 4 weeks free insurance can be arranged on request.